the fundamental principles of fluid science; and the application problem solving related to fluid mechanics. 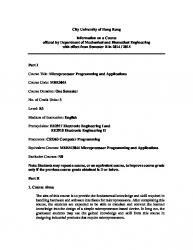 Course Intended Learning Outcomes (CILOs) Upon successful completion of this course, students should be able to: No. CILOs Weighting* 1. solve basic problems of fluid statics. 1 2. solve problems of the fundamental principles of fluid flow. 2 3. apply principles of fluid flow in pipe flow and external flow. 3 4. predict relationship of parameters of fluid flow. 1 *Weightings are assigned to the CILOs according to their relative importance to the course (3 = most important). Students are required to read the relevant reference books before each seminar session. A seminar is the major in-class teaching and learning activity in which lecturers would explain the selected topic by oral presentation, and would discuss with students through case problems, calculation exercises and real life examples. Students are required to generate/answer questions during a seminar session, and/or complete exercises after a seminar session. 1. A Pre-Class Study is a combination of selected reference books and/or lecture notes reading before each seminar session. 2. Seminar is an in-class activity in groups involving oral presentation by lecturers and discussion with students on a selected topic through illustrating exercises, real-life examples and question generation by the students and answering by peers or by the lecturer. 3. An Assignment is a combination of case problems and/or calculation exercises for guided students learning. *This will not contribute to contact hours. Note: A student must obtain a minimum mark of 35 in both coursework and examination and an overall mark of 40 to pass the course. 1. An Assignment is a combination of case problems and/or calculation exercises for guided students learning. 2. A Test is in the form of multiple-choice questions and/or calculation problems and/or short questions. 3. An Examination may consist of multiple-choice questions and case/calculation problems. Assignment/Test Examination Weighting* ● ● 1 CILO 1 ● ● 2 CILO 2 ● ● 3 CILO 3 ● ● 1 CILO 4 Assessment Percentage 40 60 *Weightings are assigned to the CILOs according to their relative importance to the course (3 = most important). Grading of Student Achievement (refer to “Grading of Courses in the Academic Regulations”) The grading is assigned based on students’ performance in assessment tasks/activities. Grade A The student completes all assessment tasks/activities and the work demonstrates excellent understanding of the scientific principles and the working mechanisms. He/she can thoroughly identify and explain how the principles are applied to science and technology for solving physics and engineering problems. The student’s work shows strong evidence of original thinking. He/she is able to communicate ideas effectively and persuasively via written texts and/or oral presentation. Grade B The student completes all assessment tasks/activities and can describe and explain the scientific principles. He/she provides a detailed evaluation of how the principles are applied to science and technology for solving physics and engineering problems. He/she demonstrates an ability to integrate taught concepts, analytical techniques and applications via clear oral and/or written communication. Grade C The student completes all assessment tasks/activities and can describe and explain some scientific principles. He/she provides simple but accurate evaluations of how the principles are applied to science and technology for solving physics and engineering problems. He/she can communicate ideas clearly in written texts and/or in oral presentations. Grade D The student completes all assessment tasks/activities but can only briefly describe some scientific principles. Only some of the analysis is appropriate to show how the principles are applied to science and technology for solving physics and engineering problems. He/she can communicate simple ideas in writing and/or orally. Grade F The student fails to complete all assessment tasks/activities and/or cannot accurately describe and explain the scientific principles. He/she fails to identify and explain how the principles are applied to science and technology for solving physics and engineering problems objectively or systematically. He/she is weak in communicating ideas and/or the student’s work shows evidence of plagiarism. Fundamental concepts: Viscosity; Newtonian fluid; fluid pressure; Pascal’s law; pressure measurement. Fluid statics: Hydrostatic thrust; centroid; centre of pressure; buoyancy. Fluid flow: Flow pattern; types of flow; flow continuity; Bernoulli’s equation; flow measurement; momentum equation; applications of Newton’s second and third laws of motion. Pipe flow: Behaviour of real fluid; laminar and turbulent flow; Reynolds number; major and minor losses; friction factor; total energy gradient. External flow: Open channel; hydraulic mean depth; steady uniform flow. Similarity and dimensional analysis: similarity; dimensionless numbers; dimensionless groups. Recommended Reading 1. 2. 3. 4. 5. 6. 7. 8. Fluid Flow, ASHRAE Handbook – Fundamentals (latest edition), ASHRAE Inc. Young, D.F., Munson, B.R., Okiishi, T.H., A brief introduction to fluid mechanics. Hoboken, NJ: Wiley, 2004. Street, R.L., Watters, G.Z., Vennard, J.K., Elementary fluid mechanics. New York: J. Wiley, 1996. Iynkaran, K. and Herath, K., Basic applied fluid mechanics: hydrostatics, dynamics and pumping systems. Singapore: Prentice Hall, 1993. Crowe, C.T., Elger, D.F., Roberson, J.A., Engineering fluid mechanics. Hoboken, NJ: Wiley, 2005. Douglas, J.F., Gasiorek, J.M., Swaffield, J.A., Fluid mechanics. Upper Saddie River, NJ: Prentice Hall, 2001. Fox, R.W., McDonald, A.T., Pritchard, P.J., Introduction to fluid mechanics. Hoboken, N.J.: Wiley, 2004. Marquand, C., Croft, D., Thermofluids: an integrated approach to thermodynamics and fluid mechanics principles. Chichester: J. Wiley, 1994.